Protect your rights and maximize your payout after an Arizona car accident. We answer key questions and show you how to build a strong insurance claim. Car accidents often occur spontaneously. When they do, you may have precious seconds to react. Whether you’re the victim of a collision or the driver who caused it, knowing what to say and do at the accident scene can have a profound effect on any future claim. Below are the 10 steps every driver should take following an Arizona car accident. There are also answers to some of the most frequently asked questions that can come up. Following these steps will help you build a viable property damage or personal injury claim. What do I say to the 911 dispatcher? What do I do if people are injured? What if I’m the only one who’s been injured? What if no one is injured and only the cars are damaged? What if I hit a parked car and no one is in it? Why do I have to report the accident if it wasn’t my fault? Are there mobile applications I can use to report the accident to my insurance company? Are there other behaviors which play a role in comparative negligence? What’s the difference between soft tissue and hard injuries? What should I do if the other driver says I’m at fault and demands I pay for his or her property damage or injuries? What are my rights under Arizona’s 3rd party liability rule? 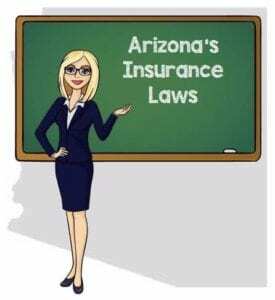 How much insurance must I have in Arizona? Do I have to report the accident to anyone else beside my insurance company? What if the police were dispatched to the scene? What if the police gave me a citation? How much can I sue for in an Arizona Justice of the Peace Court? How can I find out more information about filing a lawsuit? Do I sue the at-fault driver’s insurance company? What if I miss the date? What do I do if the insurance company is stalling on settling my claim? If you have been in an accident, pull over immediately in a safe area as close to the accident scene as possible. Check to see if anyone is injured and call 911. The location. Be specific. Check your surroundings and locate the nearest street sign, mile marker or landmark. Giving the dispatcher the specific location will assure that police, fire and rescue arrive quickly. This is especially important if people require emergency medical assistance or the accident is posing a danger to others. If there is danger. Car accidents are never tidy. There will likely be shattered glass, twisted metal and cars pointing in different directions. These are factors which can pose a serious danger to everyone. Give the dispatcher an accurate description of the scene, especially if you think the accident is posing a danger to anyone. If anyone is injured. Some injuries can be obvious, while others less so. Sometimes symptoms can take hours, or even days to appear. Tell the 911 dispatcher if anyone appears injured, complaining of pain, bleeding, unconscious, disoriented, nauseous, or presenting other signs of injuries. Each area has their own policies regarding when police, fire and rescue will be dispatched to the scene of an accident. Most law enforcement agencies will not dispatch emergency personnel unless there are injuries or the accident scene is presenting a clear danger to others. You’re required by Arizona State Law to stop immediately at the accident scene or as close as safely possible. Be sure to park in a safe place which will not jeopardize your safety or the safety of others. Give each other your names addresses and the registration number of the cars you were driving. If asked, show your driver’s licenses to each other and/or to the passengers in the other car. Render reasonable assistance to anybody who was injured in the accident, and if necessary, drive them to a hospital for medical treatment. Your injuries may be obvious. You may be bleeding, dizzy, or in obvious pain. However, some injuries may not be so obvious. After a car accident, adrenaline may be coursing through your veins, your heart may be racing, and your legs shaking. Symptoms like swelling, bruising, strains and sprains can take hours or even days to show up. Don’t be heroic. When the paramedics arrive let them evaluate you. They will be able to tell if your injuries are serious enough to require transporting you to the local hospital. Note – Failing to seek immediate medical treatment after an Arizona car accident can work against you. It could be an invitation to the insurance companies to say your injuries had nothing to do with the accident. Instead, they could say the injuries were actually from a separate incident. If you’ve struck another car but no one was in it, you must locate the owner of the car. Once you find them, give that person your name and address and other important information. If after making a reasonable search you can’t find the owner of the damaged car, you must leave a written note. The note should include your name and address, an explanation of what happened, and must be left in a conspicuous place. The first minutes after a collision can be crucial in building your property damage and personal injury claim. Evidence gathered at the accident scene will be the foundation upon which your claim is constructed. This is the only time you’ll have access to certain kinds evidence. These items will likely be critical to the insurance companies when seeking compensation for your damages. Damages can include your medical and therapy bills, out of pocket expenses for medications, costs of travel to and from treatment, lost wages, and pain and suffering. *Note: If the other driver is not the owner of the vehicle, be sure to get the owner’s information as well. Create a written diagram sketch of the accident scene. An accurate diagram sketch can be very helpful to you and to the insurance companies when determining fault. Tip: Download this free car accident diagram application to make this step easier. the position each car was in before and after the collision. Ask any witnesses to stay until the police arrive. While witnesses aren’t legally required to stay, it may be helpful to you if they did. The police may want to speak with them to get an unbiased opinion of the cause of the accident. As part of your insurance company’s “Cooperation Clause”, you’re required to report an accident immediately. This is true whether the accident was your fault or not. Failing to do so can result in cancellation of your policy or a failure to renew your policy at its expiration date. Virtually all car insurance policies have what is referred to as a “Cooperation Clause“. This clause requires the insured (you) to promptly report any accident you were involved in. After reporting the accident you’re required to assist the insurance company in its investigation. Cooperating with your insurance company helps them to quickly and accurately assess potential liability. The insurance company can settle claims before they snowball into massive losses. By failing to promptly report the accident to your insurance company, you’re in violation of the cooperation clause. You may also unintentionally give the other driver a substantial advantage. While at the accident scene it may have appeared clear the other driver was at fault. He may have even apologized for the collision. But what you don’t know is that everyone is not as honest as you. He may have returned home and decided the accident was really your fault. If that’s the case, he may get the chance to file a property damage or personal injury claim with your insurance company before you. Or he may hire an attorney to sue you. Unbelievable…but true. It happens all the time. Mica was involved in a minor “fender bender.” Immediately before the collision she had been traveling south on Legacy Drive. As she approached the intersection at 94th Street, she noticed a northbound car at the intersection in the left turn lane waiting to turn left. The car was being driven by Jeff who was on his way to work. Jeff was late and trying to make up time. Believing he could make the left turn across traffic before Mica entered the intersection, he turned left in front of Mica, causing her to strike the rear passenger side of his car. Both drivers pulled over to inspect the damage and see if either was injured. The damage to both cars appeared minor and neither said they were hurt. Jeff apologized, saying he should have waited for Mica to pass. After exchanging insurance information they went their separate ways. Believing Jeff was at fault, Mica decided not to report the accident to her insurance company. She was sure Jeff’s insurance company would pay for the damage. She also feared that if she reported the accident to her insurance company, her premiums would rise. Jeff violated the law by failing to yield the right of way to Mica. After arriving home later that day, Jeff complained to his wife that his back was sore and his left arm was throbbing with pain. She drove him to the local hospital emergency room where he was examined by a doctor. Jeff was diagnosed with a fractured wrist and sprained tendon in his left shoulder. His wrist was casted and he was told to return in a month to see how the wrist was healing. The next day Jeff hired a personal injury attorney who advised him to seek continued treatment and additional physical therapy from a local chiropractor. Because Jeff was a welder, he was unable to work. Two months later Mica opened her mail to find a letter from Jeff’s attorney. The letter informed Mica that Jeff sustained serious injuries in the accident resulting from her negligence. It also stated that Jeff’s medical and chiropractic bills to date were $35,000, with more to come. In the two months since the accident, Jeff’s attorney had compiled witness statements that said he had already crossed the intersection when Mica purposely increased her speed and struck him. Jeff’s attorney had also compiled his medical and therapy records, receipts for his out-of-pocket expenses, and verification of his lost wages. By failing to immediately report the accident to her insurance company, Mica not only violated the terms of the cooperation clause, but also gave Jeff’s attorney a substantial head start on his personal injury claim. If she had contacted her insurance company promptly after the accident, her insurance company would have opened an investigation two months ago. Mica was understandably shaken. She wondered if she was going to lose her life savings over an accident, and whether or not her insurance company would protect her. Are there mobile applications to report the accident to my insurance company? Yes. 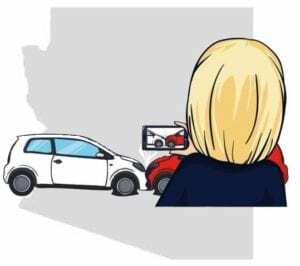 There are mobile applications available to help document and report an Arizona car accident. Smartphone users can do nearly all of the claims process right from the app. You can also use your smartphone to take pictures and video at the accident site. Doing so can have a positive impact on your insurance claim. No! At least not to anyone at the accident scene. Honesty is the best policy… but when it comes to car accidents, there is no legal or practical reason you should admit to, or discuss fault, at the scene of an accident. Doing so is just a bad idea. In car accidents, pure comparative negligence refers to comparing the negligence of each driver and assigning each a percentage of fault. Once damages and compensation amounts are determined, these percentages become very important factors. This means that a victim in an Arizona car accident can still seek compensation from a negligent driver even if the victim shared some responsibility. This is true whether the victim was 1% at fault or 99% at fault. Elton was driving home after a full day of work in Scottsdale. As he approached a red light at the intersection of the 101 and Scottsdale Road, he decided to accelerate to get through the light before it turned red. What Elton didn’t know was that seconds before the crash, Becca was texting back and forth with her boyfriend, and may have been texting as she entered the intersection. When the police arrived they spoke with Becca and Elton and also with another driver who pulled over at the scene. The driver said she was right behind Becca and saw her texting as she entered the intersection. The jury decided Elton’s percentage of fault (or his negligence) was 60%, while Becca’s negligence amounted to 40%. As a result, instead of awarding Becca the $50,000 she sued for, the jury awarded her $30,000 (the decrease representing the 40% of Becca’s own negligence). Yes. Call the other driver’s’ insurance company as soon as possible after the accident. Tell the insurance company if you sustained property damage or injuries. If you were injured, tell the insurance company you’re seeking ongoing medical treatment and will keep them advised of your status. Soft tissue injuries can include minor bumps and bruises, abrasions, strains and sprains to muscles, tendons and ligaments and whiplash. Hard injuries include things like fractures, disfigurement, loss of body parts, serious head trauma, disk herniations, deep cuts and gashes and 3rd degree burns. What should I do if the other driver says I’m at fault and demands I pay for his property damage or injuries? Don’t do it!! If the driver demands you pay him, politely refer him to your insurance company. You’ll be contacting them too to report the accident, so that you’re not in violation of the cooperation clause in your policy. As a result, your insurance company will begin an investigation into the crash. That’s what they do, and that’s why you pay your monthly premiums. From there, your insurance company is legally bound to not only investigate the claim, but also provide you an attorney at no cost. 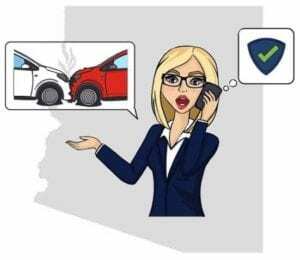 The State of Arizona is not a no fault insurance state. Instead, they follow the 3rd party liability tort doctrine. 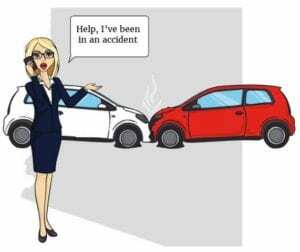 In car accident cases, 3rd party tort liability means the victim of an accident has a right to expect compensation for their damages from the at-fault driver. Under Arizona’s 3rd party liability rule, the at-fault driver may be responsible for paying the medical bills and costs related to your treatment. They may also have to pay the cost of repairs to your car as well as any personal property damaged in the accident. This can include damage to items found in your car (like jewelry, computers, electronic devices, etc. ), as well as property outside the car like mail boxes, fences, light or electric poles, guardrails and more. They will also be held responsible for your lost wages, and for your pain and suffering. 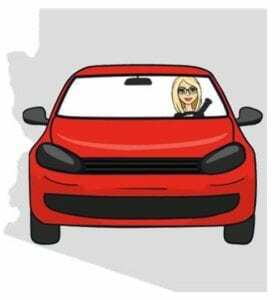 The State of Arizona requires that every motor vehicle driven on Arizona roadways be covered by property damage and personal injury liability insurance. This requirement also applies to golf carts, motorcycles and mopeds. For more information on insurance requirements in Arizona, check out the Arizona Department of Insurance website. If a police officer is dispatched to the accident, they may file the required report for you. This will happen if there are injuries to anyone involved, damage to property over $1,000, or if they end up issuing a traffic citation. If this is the case, the officer must complete a written report of the accident within 24 hours after finishing the investigation. The investigating officer must also forward a copy of the report to the Arizona Department of Transportation. 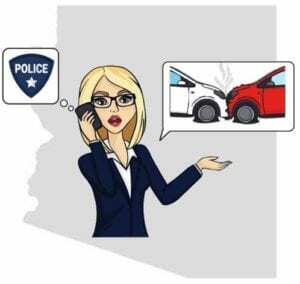 To get a copy of a police report in Arizona, you must contact the individual police agency in the city where the accident occurred. 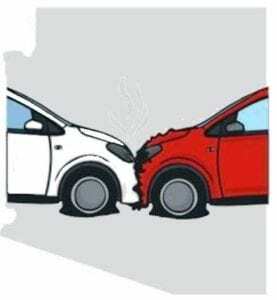 If the accident occurred on one of Arizona’s State Highways, you may obtain a copy of the accident report by contacting the Arizona Department of Safety. You must file form Form DPS 802-06334. The fee for an accident report is $9.00 for the first nine pages and $1.00 per page thereafter. You have every right to speak with the police in an effort to explain what happened. But you’re also required to follow their direction at all times. The accident scene is the last place to start interfering. Doing so will only delay the police investigation, and may result in your arrest. Yes. If you’re asked questions about the accident, you must answer truthfully. However, if you’re being questioned about anything outside of the accident, you have the right not to say anything other than identifying yourself. This includes questions about driving under the influence, driving while intoxicated, possession of drugs, or for any other action which might result in criminal charges being brought against you. 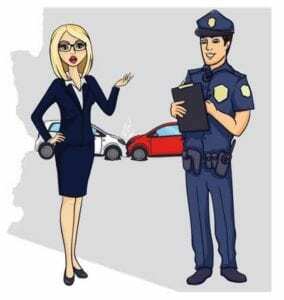 After the investigation, if the police decide you were in violation of a traffic law, they may decide to issue a citation. You can always try talking them out of it, but if the officer does issue the citation you must accept it. It’s important to remember that accepting the citation is not an admission of guilt or responsibility. Some property damage and personal injury claims can be handled without an attorney, or “Pro Se.” However, there are other claims which should always be handled by an experienced personal injury attorney. You can usually act in a “pro se” capacity if your injuries are relatively minor. These “soft tissue” injury claims are frequently settled within a relatively short time while rarely finding themselves in court. These injuries include sprains, strains, contusions, abrasions, minor cuts, and whiplash. They often cause pain, swelling, bruising, pain and discomfort, but are not life-changing in nature. Because settlements in soft tissue injuries are normally modest, retaining an attorney could result in you receiving a net settlement which may be less than the settlement amount you could have negotiated on your own without an attorney. If you have more serious injuries like fractures, disk herniations, deep gashes, burns, or head trauma, you’ll certainly need an experienced personal injury attorney. In serious injury claims, lawsuits filed on behalf of victims are frequently necessary. In these situations insurance companies rarely offer settlement amounts which are fair and equitable. There is just too much to lose by representing yourself in a serious injury claim. As a “pro se” victim, you would have little leverage. The insurance company claims adjuster may lead you to believe you’re a great negotiator. In the end without an attorney, you really are at the mercy of the insurance company, and there isn’t much you can do about it. Serious injury claims often require extensive up-front costs including the hiring of medical experts, independent testing, accident reconstruction, depositions, interrogatories, requests for production, and other legal procedures unavailable to you as a non-attorney. Experienced personal injury attorneys will normally not charge you any legal fees for an initial office visit. It’s in the attorney’s best interest to offer a free consultation to determine if your claim is viable, and will result in a settlement or court award which is substantial enough to compensate you fairly and for him to make a reasonable profit. Attorneys are like other business people. They’re in business to make a profit. The attorneys who make the largest profits for their clients are usually the most successful. Once an experienced personal injury attorney has the chance to review your medical records, police reports, witness statements and more, they’ll be able to tell you how your case will likely turn out. They should be able to offer their opinion on the strength of your claim, the approximate time frame it will take to settle, the probability of the claim having to go to trial, and the general payout you can expect. If the attorney accepts your case, he’ll not charge any legal fees or costs until the claim is settled or won in court. At that time depending upon the contract you entered into with the attorney, you’ll be obligated to pay the attorney anywhere from 25% to 40% of the gross settlement or court verdict. There are times where an insurance company just refuses to offer a fair settlement amount, or they flat out deny a legitimate claim. This often occurs when the majority of the damages are for therapeutic and chiropractic treatment. If your injuries are soft tissue in nature, an attorney may decide there’s just not enough money in the claim to justify his time and effort. This is because oftentimes the final settlement amount will barely compensate you as the victim and the attorney for his work. When this occurs, you can decide to proceed on your own by filing a lawsuit against the at-fault driver in one of Arizona’s Small Claims Courts. Each county has justice courts presided over by a Justice of the Peace who is elected for a four year term. Cases in Justice Courts include civil lawsuits and small claims cases. In these courts, small claims cases are heard for amounts in dispute of $3,500 or less and negligence claims stemming from car accidents in the amount of $10,000 or less. These cases are much more informal than a regular courtroom proceeding and there is no appeal once a decision is reached. 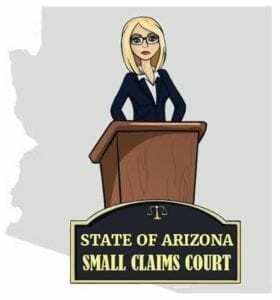 How can I find out more information about filing a lawsuit in Justice of the Peace small claims court? 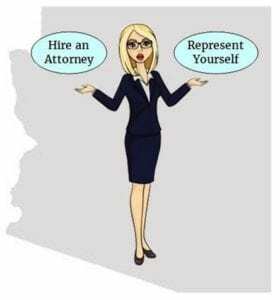 For more information about Arizona’s Justice of the Peace Courts, you can visit their website. You can also access the forms you’ll need to file online. No! The driver’s insurance company did not cause the property damage or your injuries. The driver did. Therefore the law requires you to sue the driver and not his or her insurance company. No. While attorneys are permitted to appear on behalf of their clients in Justice of the Peace Courts, attorneys are not permitted if you file your lawsuit in the Justice Court’s Small Claims Division. When in Small Claims Court, the formal Rules of Evidence are relaxed so participants can be free to present their cases without fearing the more formal evidentiary rules. Step 9 – Don’t Forget About the Statute of Limitations! In the State of Arizona, the statute of limitations (or “time period” in which you have to either settle your property damage and/or personal injury claim) is 2 years. This means that you have a maximum of 2 years from the date an accident occurs to either settle your property damage or personal injury claim or file a lawsuit. What if I miss the statute of limitations date? If you don’t settle your claim before the 2 year expiration date and fail to file a lawsuit within that time, you lose your legal right to pursue the negligent driver for any compensation for your property damage or personal injuries. What should I do if the insurance company is stalling on settling my claim? The first rule is don’t trust insurance companies! It’s not their job to protect you and remind you when the statute of limitations date is approaching. It’s entirely up to you. 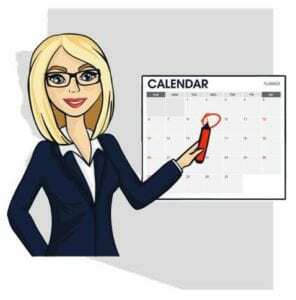 Be sure to enter the statute of limitations expiration date in your calendar, your computer, and your cell phone calendar app. Give yourself plenty of reminders. If the insurance company is stalling and the statute of limitations expiration date is approaching, you should proceed with your case by taking it to court. It’s safe to say you won’t receive any letters, emails, or phone calls reminding you to do so.